Rather surprised myself, finding that I had not seen this before. I was sure I had at least seen the movie, directed and produced by auld acquaintances Parker and Thompson. Not knowing how a classic ends is fairly rare, and a thrill. 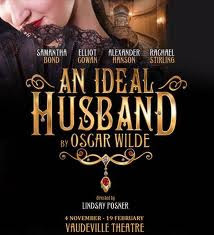 But this, like so much of Wilde, is a serious play cleverly camouflaged by wit and elements of farce. Its deepest subject is not love, but friendship, the friendship of two men, one of whom is ambitious the other who has no ambition at all; the one whose public image is of uprightness and integrity, the other who is known for idleness and dandysim; the one who has a shameful secret, the other who tells the truth. It is also a play about tolerance and forgiveness and kindness. The idle, unambitious hero understands the sanctimonious mind, he understands the sway of financial temptation, the requirements of ambition. These things are forgiven. What he does not forgive is unkindness. Samantha Bond was outstanding in a very good cast. The sets (Stephen Brimson Lewis) were golden, reflecting the way in which Wilde gilds this examination of public and private moralities. Playing at the Vaudeville Theatre on the Strand, but not, sadly, for very much longer. The movie is very good. Julianne Moore is excellent. Well directed by Olly too. My favourite of his. It was a revelation to me when it came out, because I'd never read or seen it before either. Much better, more resonant and profound, in my opinion than the more famous Earnest.